California Colleges Granted HVAC Excellence Accreditation. Since 1999 there has been a national movement to improve the quality of HVACR educational programs in the Untied States through programmatic accreditation. The national movement to improve HVACR education has arrived in the west. HVAC Excellence is pleased to announce that Mount San Antonio College in Walnut, California and Cypress Community College in Cypress, California have been granted accreditation of their HVACR programs. They join Fresno City College in Fresno and North American Heating & A/C Training Center in San Bernardino who have previously been granted accreditation of their programs as models of excellence for other California HVACR education programs to emulate. 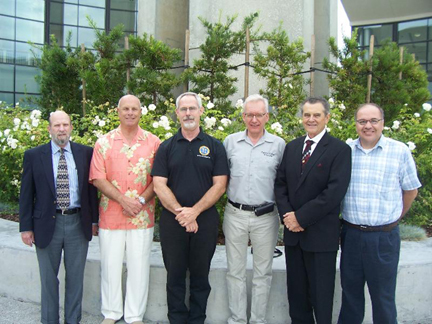 L to R Coy, Dr. Steven Donley-Dean CTE, Doug Sallade, HVACR Instructor, Richard A. Hock-Department Coordinator AC&R, Tom Tebbe, Carlos H. Urquidi, P.E.-HVACR Faculty - Cypress College. Programmatic accreditation is where an independent third party HVAC Excellence reviews a program against set educational and industry standards in: curriculum, faculty, student facilities, placement services, financial aid, advisory committee involvement, training facilities, equipment and safety. In seeking accreditation the staff at Cypress and Mount San Antonio Colleges had to complete and submit a self study evaluation of their programs that demonstrates how they meet each required standard. The self study's once completed were sent to HVAC Excellence for their executive team to thoroughly assess for compliance against each standard. 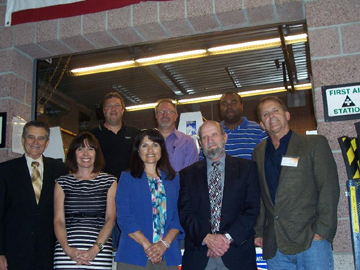 HVAC Excellence having approved the self study sent an onsite team to conduct an intense onsite review of the programs. Having reviewed all of the documentation from the self study and on site team visitation report, the HVAC Excellence accreditation review committee decided to grant accreditation of the programs. Now that the programs have been granted accreditation they can: provide employers with confidence in the quality of the program, assist students in selecting a program, assist students with transfer credits, help the students with advanced placement in the United Association apprenticeship program. Cypress Community College and Mount San Antonio Colleges are part of an elite list of schools nationally and locally that have validated their programs through programmatic accreditation.